The Miami Open announced its 2019 player list earlier this week and Roger Federer is scheduled to show up at the tournament that has moved from Key Biscayne to the Miami Dolphins football stadium. Due to his longevity on tour, the 37-year-old Federer has been allowed to skip Masters 1000 events in recent years without penalty or without having to cite an injury. Miami has been one of the casualties on a few occasions. The Swiss was absent in 2013, 2015, and 2016 (withdrew due to illness) before capturing the title in 2017. He returned last spring but lost his opening match to Thanasi Kokkinakis. Federer, who is also playing the clay-court swing this season for the first time since 2016, appears to be headed for an 18th career appearance in Miami–and first, naturally, at the new venue. 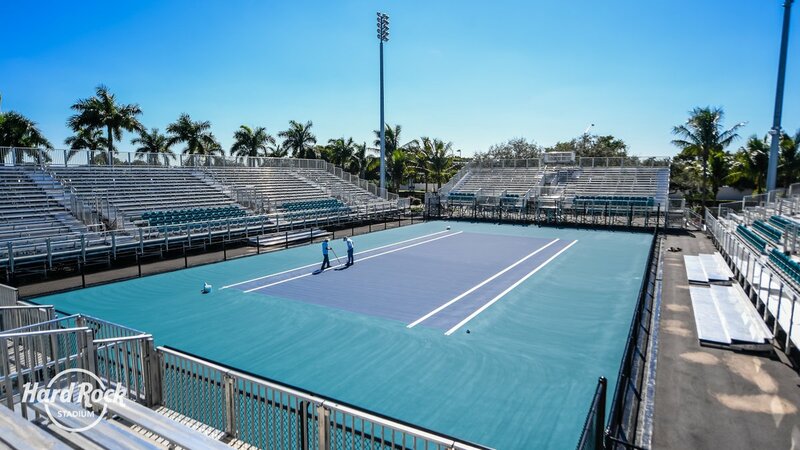 In a recent video posted on various social media channels, Dolphins president Tom Garfinkel unveiled what the new Miami Open will now look like when it moves to Hard Rock Stadium. Highlights include luxury seating, live music, global art, and a vast international cuisine. Parking is on site–unlike how it was on Key Biscayne–for easy access to the courts. There are 18 practice courts, 12 match courts, and additional areas for fans to dine and relax. The largest video board in tennis will be outside the main stadium for all tournament-goers to see. Itaú remains the title sponsor of the tournament. “We are excited that Itaú has decided to continue our partnership for another five years and be a part of ushering in a new era of the Miami Open at Hard Rock Stadium,” tournament director James Blake when a deal was reached last year. As for the rest of the player field, the men’s list currently includes Novak Djokovic, Rafael Nadal, reigning Indian Wells title winner Juan Martin Del Potro, 2018 Miami runner-up Alexander Zverev, and defending champion John Isner. Nadal, however, is not expected to play. The world No. 2 has said that his spring hard-court schedule currently includes only Acapulco and Indian Wells, but he may decide to show up in Miami if he loses early in either Acapulco and/or Indian Wells.